B. B. King "Lucille" Model Electric Guitar by Gibson, Inc.
T. Wilson King watches as B. B. 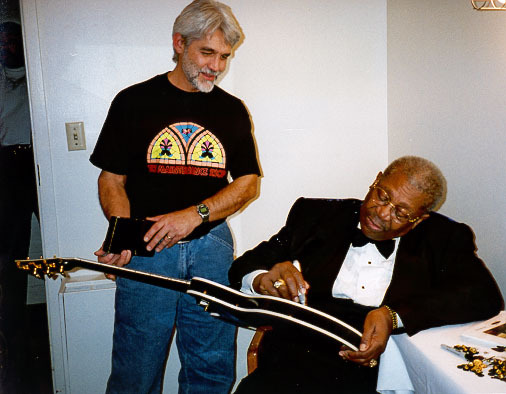 King autographs the NMM's "Lucille" electric guitar in his dressing room at the Orpheum Theater, Omaha, Nebraska, November 5, 2000. NMM 10025. Electric guitar by Gibson Guitar Corp., Nashville, September 30, 1997. 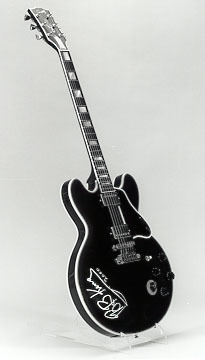 This modified, Thin Series ES-355 was first introduced in 1980 as the B. B. King Custom model in the Gibson Artist Collection. It was designed without soundholes because King had previously stuffed the soundholes of his earlier, electric, hollow-bodied arch-tops with cloth to reduce feedback. This model, which is still in production, features a sleek ebony finish and gold-plated hardware. It was autographed by King on November 5, 2000, prior to its acquisition by the NMM. Purchase funds gift of T. Wilson & Sandra L. King & family, Michelle Maloney/Carey's Bar, Mark Phillippi, Radigan's Main Street Pub, Larry Brady, Michael Wickersham, Charcoal Lounge/Tom French, Silver Dollar Restaurant/Jere Chapman, and Jon & Carol Robertson & family, Vermillion, South Dakota; Elizabeth Spivey & David Bergin, Yankton, South Dakota; Dave Bernstein, Sioux City, Iowa; and others who love the blues, 2001. Riley B. King was born in Indianola, Mississippi, on September 16, 1925. He took the stage name, B. B. King, after being dubbed the "Beale Street Blues Boy," while employed as a disc jockey at WDIA in Memphis in the early 1950s. One of his first recordings, Three O’Clock Blues, was a national success. So popular was the young musician that in 1956 he booked an unbelievable 342 one-night performances! The story of why King decided to call his guitars "Lucille" dates back to 1949. While King played at a club in Twist, Arkansas, a fight broke out between two men over a woman named Lucille. A barrel of kerosene that was being used to heat the building was knocked over and started a fire. King almost lost his life, while trying to save his guitar. Consequently, he started calling them "Lucille," as a reminder never again to be so foolish. On his 1968 album, Lucille, he wrote, "I've had many guitars—and always call them Lucille. She's taken me a long way, even bought me some fame—most of all, she's kept me alive, being able to eat. Sometimes I get to a place I can't even say nothing—sometimes when I'm blue, seems Lucille tries to help me, calls my name—she's just like a woman, and that's the only one I've had that seemed I could really depend on. I've been married and each time separated—but Lucille never separates from me. She always stayed with me." Bringing "Lucille" to Vermillion, as a testament to the legacy of B. B. King—one of the defining figures of the blues for half a century—was a suggestion made by T. Wilson King of Vermillion, a blues musician in his own right, who played for house parties, in coffee shops, and in honky-tonks in California in the 1960s and '70s. T. Wilson King asked B. B. King to autograph this guitar on November 5, 2000, at a concert held at the Orpheum Theater in Omaha, Nebraska, and subsequently spearheaded a fund-raising concert on December 14, 2000—"An Evening of Fine Acoustic Music"—at The University of South Dakota's Farber Hall, to raise funding to acquire the instrument for the NMM.